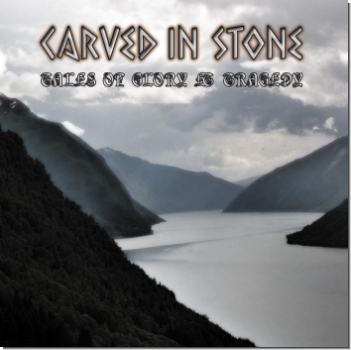 Main page » Music (CDs, LPs) » Ambient / Folk » Carved in Stone "Tales of Glory & Tragedy"
Carved in Stone "Tales of Glory & Tragedy"
Mystic-Folk-Music. After the great success of the foregoing releases, Carved in Stone is going to fascinate the heathen hordes again with the new album "Tales of Glory & Tragedy". This masterpiece of acoustic music leads the listener straight into another world and another time far beyond human imagination. Once more, Carved in Stone´s mastermind Swawa kept her unique mystic folk style, the result is a journey through long forgotten tales, surrounded by epic choirs.